Yoga for you, whatever your age, skill level or experience! £6.00 for *’Drop In Place ‘ pay on day,these spaces are allocated on a first come first served basis. Door opens usually 30 mins prior to class, or for back to back classes enter as first class leaves. £5.00 for *’Reserved Place‘ this is only when block booked and advance paid for full calendar month. If you can’t make it to your class, ‘Reserved Place’ can be transferred to other yoga classes within the same calendar month, space permitting, they cannot be carried over to other months or to other people. Currently there is ‘Drop In’ or ‘Class Transfer’ availability in most classes, these spaces are allocated on a first come first served basis. Yoga You Sanctuary operates a strict Cancellation Policy. Traditional Hatha Yoga Practice is modified according to need, keeping you strong and healthy on all levels of being. A different variety of postures (asanas) will be undertaken each week, and comprise movements that are designed to fully stretch the body, and include some basic postures that must be worked upon regularly, plus other postures that will be used more intermittently to help increase mobility, suppleness, strength, stamina, flexibility, balance, co-ordination and generally improve your well being. Commencing with a warming up session to stretch and energise the whole body, bending the spine forward, backwards, laterally and rotational, the postures also invert the body and work on the eyes, the head and the neck. Moving onto ASANAS…. This sequence can be adapted to suit individual needs and abilities; familiarity with such can help form the basis of personal practice, development and evaluation. Students are encouraged to work within their own personal limitations without forcing or straining and are also asked to work sensitively, feeling their way and gradually building up a greater self awareness, thereby avoiding over exertion or injury. Breathing Work – Known as PRANAYAMA exercises. Students are asked to develop a conscious awareness of their breathing and its importance in de-toxifying the whole body, improving digestive processes, calming the emotions, steadying the action of the heart and slowing down the mind. These techniques are introduced at various points throughout the session and you may be asked to observe, slow, count or balance the breath during asanas and meditation/relaxation. Relaxation, Concentration and Meditation – In either seated or lying down positions, students are helped to identify levels of tension within their bodies and to contrast it with the feeling of relaxation or ‘letting go’; some of this work is encompassed in the asana period. After relaxation the student then gradually progresses to concentration turning the attention inwards so that the mind and body are stilled and quiet, before moving onwards to meditation, where guidance is given to become more self aware using creative imagination and the senses. Philosophy of Yoga – This is, in part, incorporated into the various components of class, and occasionally a short talk may be given to provide some insight into the background of yoga and related issues. Information handouts are given on a monthly topic. Focus on breathing and meditation – Suitable for those requiring a softer practice, or for people with limited mobility, or wishing to work in chairs. For example, in these classes I sometimes have a combination of very fit people who wish to meditate and work very gently, with people who are recuperating from things like hip replacement operations or who maybe arthritic. 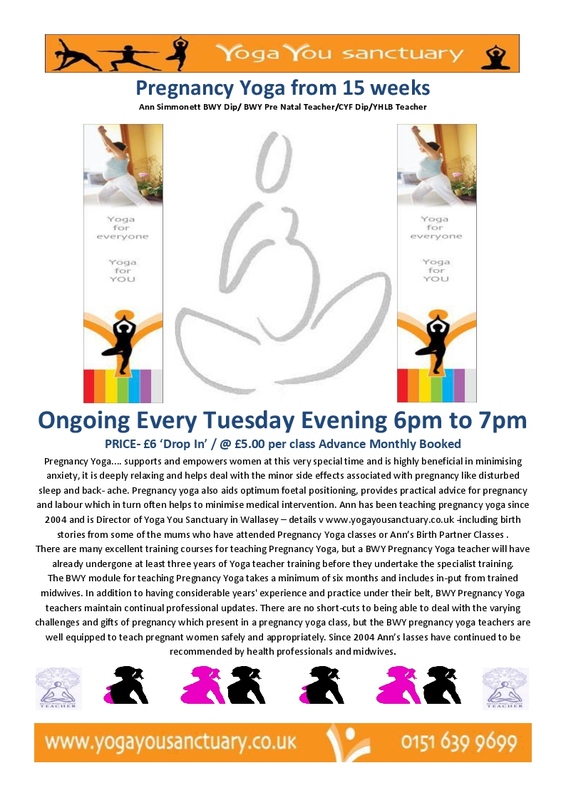 A very gentle class also suitable for first trimester/post partum, and for anyone with limited mobility or wanting to work more softly for whatever reason. The class will focus on breathing exercises and very gentle movement (chair based if necessary), and finish with a rewarding meditation. This class has greater emphasis on understanding stressors and providing coping strategies using a wide variety of physical movement (asana), which promotes health on a physical level but also by using a variety of different breathing techniques (pranayama), and meditation techniques, all of which help to soothe and calm the central nervous system by minimising adrenaline and cortisol responses, maximising well-being and responsibility for ones own health. Monthly handouts of a chosen yoga related subject are given and a theme is usually followed for the month to help underpin the practical work done in class. A yogic way of life as set out in the ancient sanskrit classical texts of yoga provides a foundation to help train the mind and the body to live life in a meaningful way, holistically, respectfully, ethically and responsibly whilst being able to cope with stress. Indeed, during the process of meditation, there has been a proven fall in the stress hormone cortisol, and also lactic acid, which consequently helps towards a feeling of calm, well being and balance. All yoga will address stress, but particular emphasis is given in ‘Stress Busting Yoga Classes’ and indeed ‘Pregnancy Yoga Classes’ by providing a sustainable practice that is empowering and enjoyable. There is very much evidence of the effectiveness of this in the birthing stories on this website and in the evaluation reports I have collected from students. 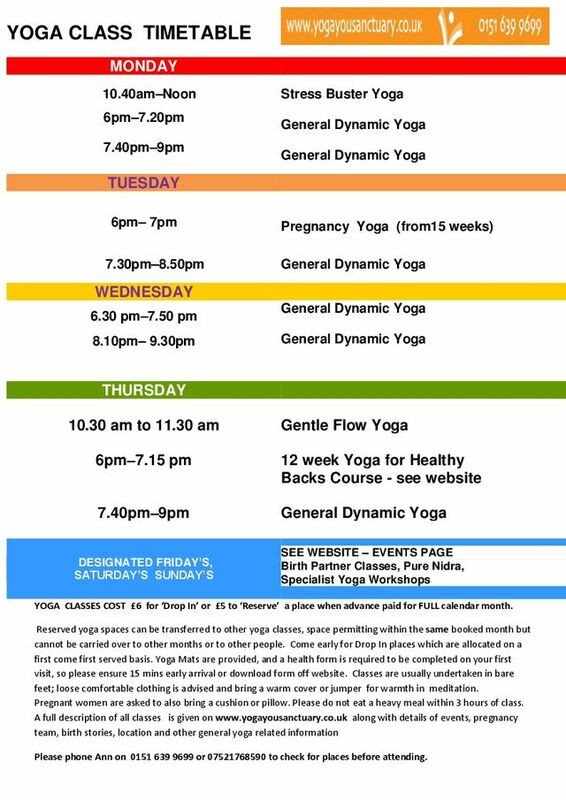 12-week courses (see Yoga For Healthy Lower Backs page for details). These classes are for groups of up to 10 people where participants learn yoga for pain-relief, healing and improvement of their back health for now and the future. Aims are re-education and re-alignment of the body plus raised self-awareness. Poses include standing, sitting, kneeling and lying down with stable comfort. Backache is a common problem. Now there is an evidence-based way to improve back health and function. The ‘Yoga for Healthy Lower Backs’ programme is 30% better than usual care. It aims to gently and progressively get sufferers back to being more active again. Validation: The University of York (Department of Health Sciences) ran one of the largest research studies into yoga to date, funded by Arthritis Research UK. Teachers from the Iyengar Yoga Association (UK) and British Wheel of Yoga designed and ran specialist group classes in five areas of the UK for chronic back pain. The positive results were published in the Annals of Internal Medicine in 2011. The Cost Evaluation in Spine Journal showed that this yoga would be cost-effective for the NHS.